Latest Google Chrome update has added “Apps” shortcut bookmark icon to Bookmarks bar. It is displayed by default at the extreme left side of the bookmarks bar at the top of Google Chrome browser. This new Apps shortcut button provide one click access to all apps installed in Google Chrome browser. Do you want to remove or hide this “Apps” shortcut and restore Bookmarks bar like it was before? 1. This can be easily done as Google Chrome has in-built option to hide “Apps” shortcut button. Launch Google Chrome browser on your computer. 2. 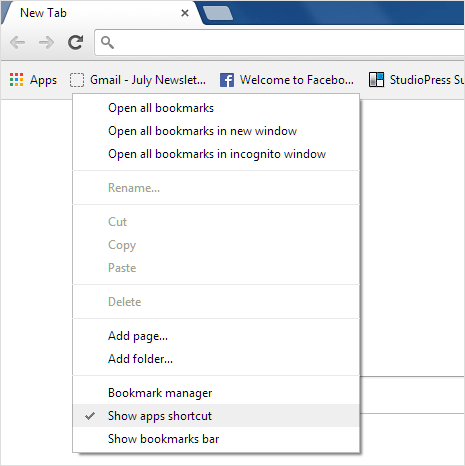 Right click anywhere on Bookmarks bar in Google Chrome and then click to uncheck Show Apps Shortcut option. This will hide or remove Apps shortcut button from the Bookmarks bar. You can get back and restore Apps shortcut anytime by checking this option again. Due to addition of this new “Apps” shortcut button, apps list do not appear by default on new tab window in Google Chrome. Instead a big search box with recently visited website thumbnails is displayed. You can also easily revert this change and bring back Apps listing on new tab in Google Chrome browser using either of many discussed methods.